Which fanmade Pokemn do you want next? Pokemon based of me and my friends (total of 5). Oh hey, I have a Fire/Ice idea I was working on. Looking forward to seeing what you’ve come up with! I am going to give a starter 2 mega evolutions, which one do you want? I like it when other folks post stuff. It makes me feel like I’m not hijacking the thread. 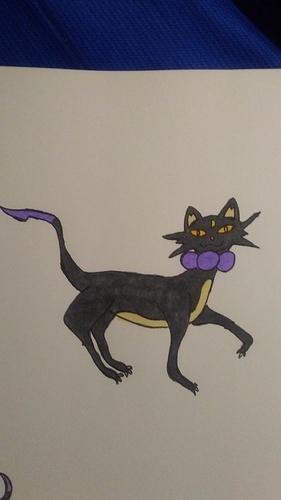 Purlock are rare Pokemon who rarely allow themselves to be seen. Sticking to the shadows and dark places by day, Purlock will only otherwise come out at night. Specializing in stealth, when a trainer finally stumbles across one, they only have one chance to catch it as a Purlock will always successfully flee otherwise. It is said that those who fail to catch a Purlock will be cursed with bad luck. Purlock are based on a black cat, resembling in some ways a witch’s familiar. It’s name is a combination of “purr” and “warlock”. Feclipse have an affinity for the wicked and will frequently ally themselves with those who are up to no good. Should their villainous counterpart be foiled, however, Feclipse will almost always be the first to escape deciding that they have allied themselves with someone far too weak or incompetent. Feclipse have an attraction to the moon that borders on obsession. Usually a stealthy Pokemon who lurks in darkness, Feclipse will come out in the open when there is a full moon. The tip of it’s tail is dangerously sharp and tipped with a highly potent venom. Feclipse are also based on black cats, more specifically a witch’s black cat. 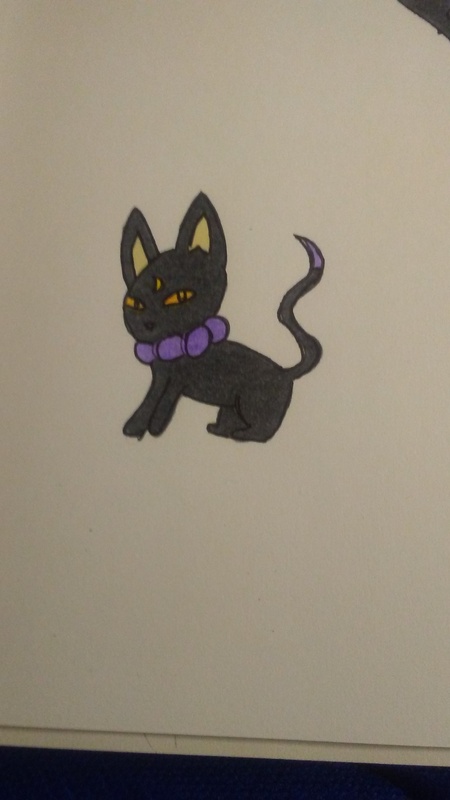 It’s name is a combination of “feline” and “eclipse”. Once a common site in every ocean on the planet, Carapin were thought to be extinct. Recently, however, Carapin have been found near a few very small islands. Highly sought after for their ornamental shells, Carapin used to dot beaches everywhere, spending colder months on land (but near the water) and warmer months out at sea. Carapin are based off of small sea turtles. 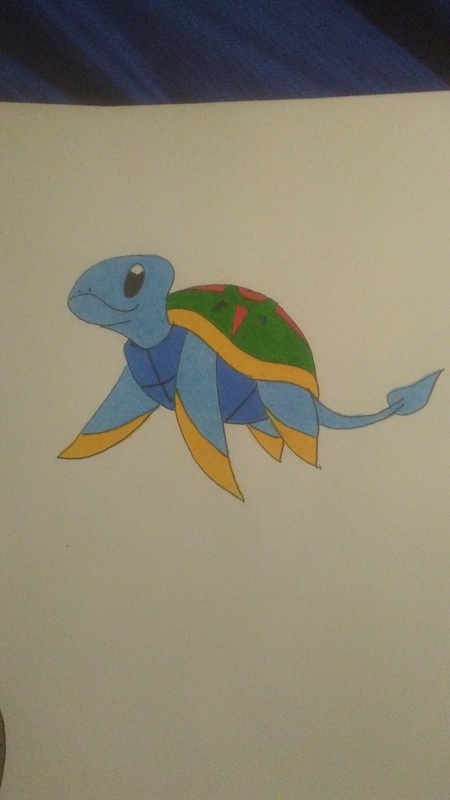 Their name is a combination of “carapace”, which is another term for shell and “terrapin”, which is another word for turtle. Their name also rhymes with the word “terrapin”. Navoise are very friendly Pokemon who love to assist sailors who are lost and to save those who are stranded. 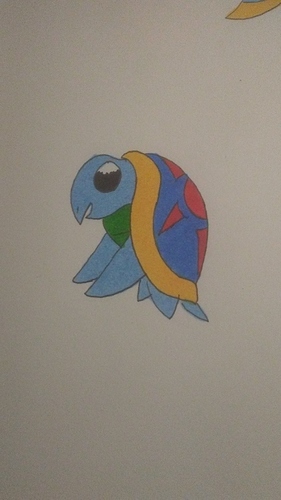 The compass design on their shells are constantly shifting, depending on the direction the Navoise is facing, and functions as an actual compass. Before being hunted to near extinction, large groups of Navoise were a common site. Navoise is based on a sea turtle. It’s name is a combination of “navigate” and “tortoise”. Once a mighty protector of ocean life, trainers may never see another Tordrake in their lifetime. Once semi-frequent, Tordrake are now thought to possibly be extinct entirely. While their pre-evolutions were recently found in a couple of very remote locations, no one has seen a Tordrake for many years. Docile and friendly, Tordrake used to roam every ocean and were considered a good omen to sailors. Make no mistake though, Tordrake are very fierce combatants when crossed and were once notorious for capsizing pirate vessels. 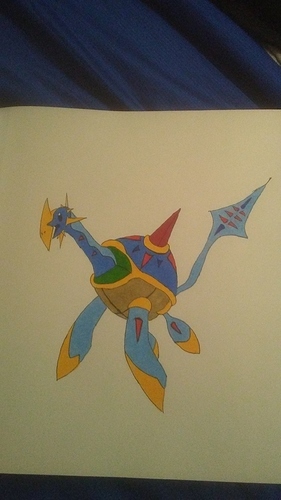 Tordrake are based on a giant sea turtle and a dragon. Their name is a combination of “tortoise” and “drake”. They are considered a pseudo-legendary Pokemon. It’s the color scheme, yeah. The designs are very different, but it’s the same shade of blue. Ikr lol, are these starters by chance? No, Pseudo-Legendary like Tyranitar, Metagross, Dragonite, etc. 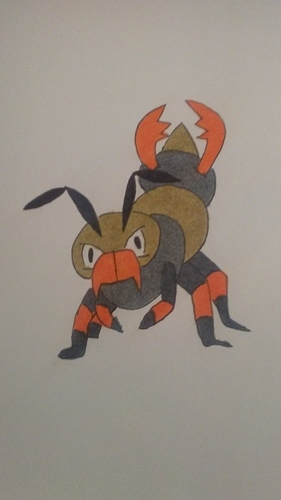 Appemite are tiny bug Pokemon who can eat through anything: wood, rock, steel … anything. 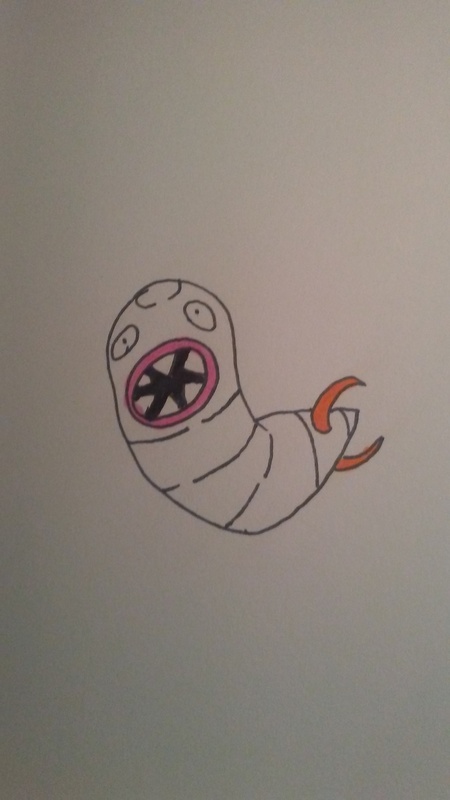 An Appemite constantly eats and once it eats enough material, it evolves. Due to the fast nature of it’s evolution, Appemites are very rare to find in the wild. Appemites have been known to bite their own trainers and other Pokemon due to their non-stop compulsion to eat. Appemite are loosely based on maggots and earwig larvae. It’s name is a combination of “appetite” and “mite”. It’s name is also a play on the word appetite. With a combined total of 165, Appemite is the weakest Pokemon that I have shared from my dex to date. Unlike Appemite, Clawig are actually quite common since Appemites evolve so quickly. Since it takes so long for a Clawig to evolve, it was once thought that this was the end of their evolution line. For the longest time, in fact, Appemite and Clawig were thought to be completely unrelated since Clawig are so abundant and Appemite are so rare. Clawig are standoffish Pokemon who are very difficult to train. Before it was discovered that Clawig evolve, trainers would typically avoid trying to train one due to it’s uncooperative nature. Clawig is based on earwigs. It’s name is a combination of “claw” and “earwig”. Note: the base design of Clawig is not mine. I used someone else’s design and added my own elements. Due to the odd evolution mechanics of it’s pre-evolutions, Dracosect was only recently discovered. Rumors of a large bug-like dragon had persisted for centuries, but there was no actual confirmation of it’s existence. Dracosect are not only powerful Pokemom, but are exceptionally loyal and friendly, making them very easy to train. Since they were only recently discovered, little else is known about them at this time. Dracosect is based on an earwig mixed with a dragon. It’s name is a combination of the dragon prefix “draco-” and the word “insect”. It is considered a pseudo-legendary Pokemon. Frizinfern, a Fire/Ice type Pokemon, is often seen in the Arctic, Antarctic, and Northern Canada. 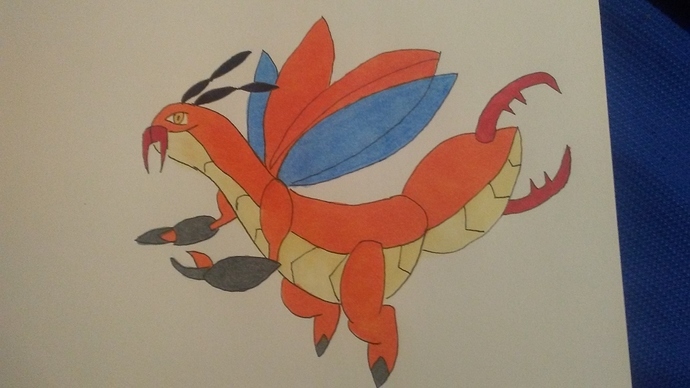 Frizinfern has a very calm nature, helping out other pokemon, but when provoked or one if its friends get hurt, it is incredibly powerful, and has been known to even take out a Moltres, with Ice type attacks, and has been proven to be related to Avalugg and Typhlosion. Frizinfern is a combination of Freeze and Inferno. I’m posting up a fire/ice one soon too.